This life size model of our Funny Reindeer in a flying pose comes fitted to an attractive metal frame and looks just as if he is taking off into the air pulling Santas sleigh. Our Funny Flying Reindeer has a charmingly bemused look on his face, maybe he has had one too many sherries with Father Christmas! 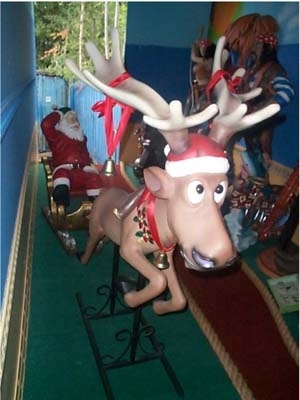 The model comes on the metal base and has a log yoke on his shoulders, a Christmas wreath around his neck and red ribbons with bells tied on his neck and antlers. 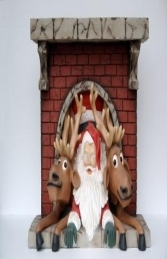 This model is also available as part of a 3 piece set with a Father Christmas & Sleigh (JR 2295). 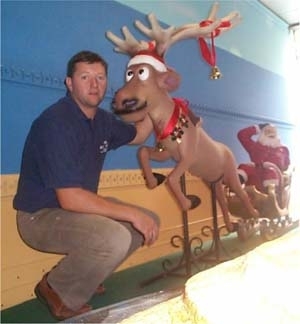 Our Funny Flying Reindeer model can be used to huge effect in your Christmas shop-window display or Grotto. 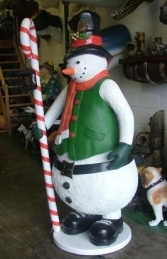 This figure is a great large scale Christmas decoration and is ideal for all businesses, pubs, restaurants, coffee shops, adventure golf courses, children’s farms, zoos, theme parks etc to decorate and promote Christmas events, activities and parties or this would even look fabulous in your own home or garden for a Christmas display to outdo all the neighbours.